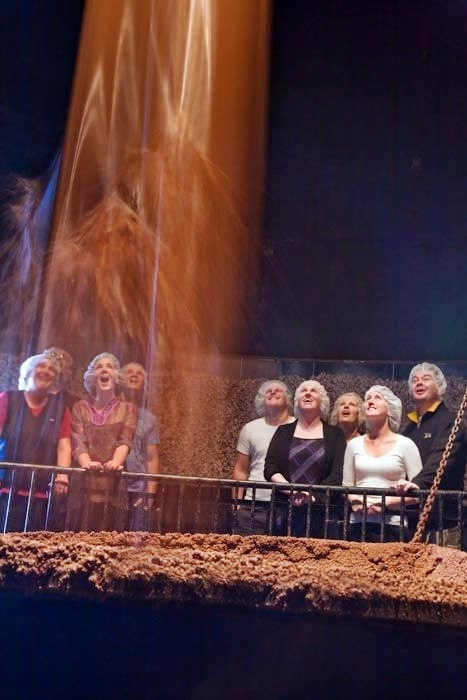 The Cadbury World tour is a chocolate-lover’s dream that overwhelms the senses! As you walk into the factory, the enticing scent of Jaffas, Turkish Delight, or cocoa welcomes you in, causing most visitors to let out a satisfied, “Ahhhh.” But that’s nothing compared to the all-encompassing chocolate scent wafting through the kitchen. Not only will your nose be working overtime, but with hundreds of buttons being made as you walk by, thousands of Roses being packaged, and one tonne of melted chocolate cascading down five stories, your eyes will have a feast to gaze upon as well. But don’t worry, your taste buds will have their chance too! In addition to receiving a bag full of samples, you’ll also have the pure liquid joy of tasting melted, still-warm chocolate. Cadbury World is located in the centre of Dunedin at the Cadbury factory site. The Visitor Centre is a colorful and educational environment with chocolate-themed displays where you can learn about the history of Cadbury and chocolate through the ages. You can even wake up your taste buds right at the start by trying a fresh cocoa bean! At the end of your tour, you’re invited to browse through the Cadbury World Shop. Most children (and some adults too) are so astonished at the sight of blocks and bars of chocolate and bags of lollies, that they turn in circles, eyes wide, unsure where to even begin. But, if you want another souvenir, one that will last longer than your chocolate or lollies, there’s plenty to choose from in the Shop as well! From T-shirts, to the famous dancing Frieda cow, to mugs and glasses, and even to miniature replicas of the Ford trucks used in the 1930’s, there’s a piece of Cadbury for all visitors to take home with them!